When you’re creating a simple dish, it’s important to have great ingredients. I didn’t have any lemons so had to use artificial lemon juice. While the dish still turned out well, I think the pop of freshness and flavor from a lemon would have made this dish fantastic. But, as you can see, it’s ok to make substitutions. Pre-heat oven to 450*. 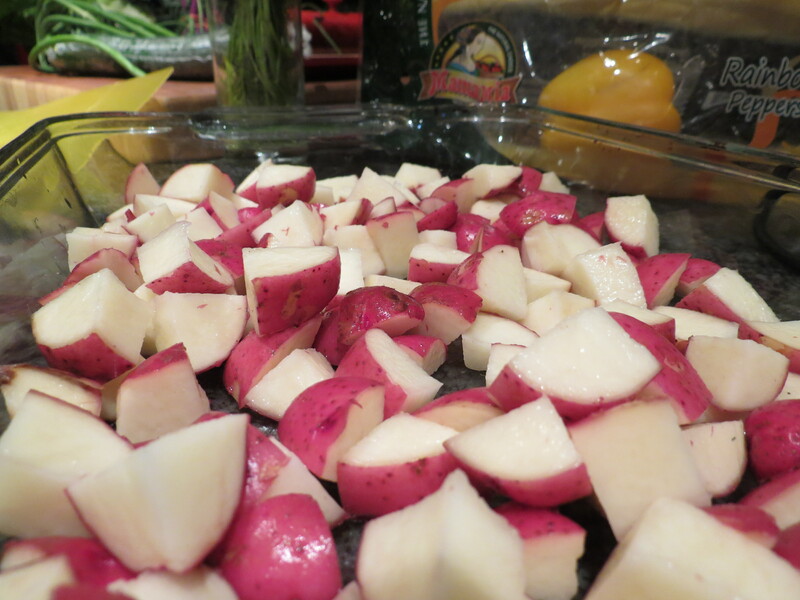 Rinse potatoes and cut into medium sized, even segments. For a tiny potato, cut in half, medium potato into quarters and cut larger potatoes to similar size. It’s important to have all the potatoes be roughly equal size so they all roast at the same speed. The next ingredient is a garlic scape. If you have a farm share or visit farmers markets regularly, you are probably familiar with this ingredient. It’s the above ground part of young garlic before the bulbs form. 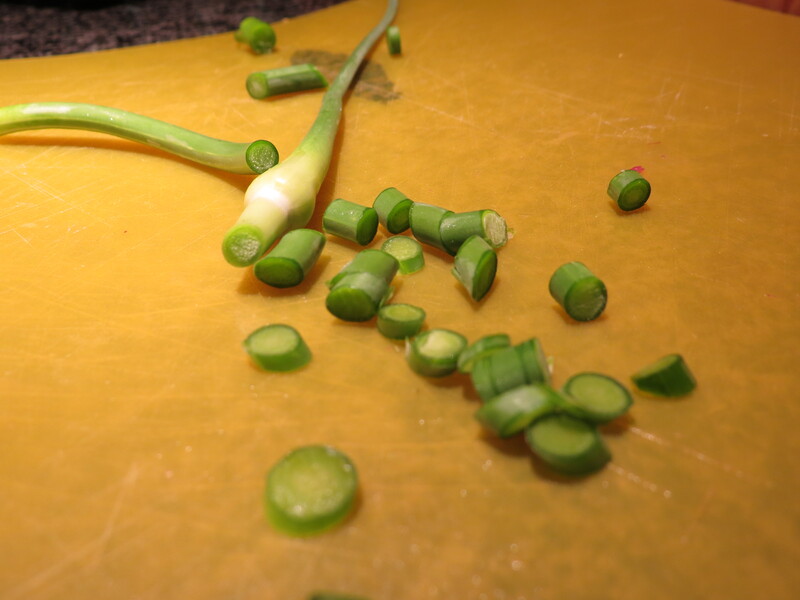 It has a mild garlic/onion flavor and CSA deliveries in the month of June are overflowing with garlic scapes. When I had originally planned this recipe in my head it called for normal minced garlic, but I am so glad I swapped it out for a garlic scape and if you have access to any, I would strongly recommend you do the same. When roasted, the scapes became caramelized, sweet, and a bit tangy and provided an amazing contrast to the rich creaminess of the potatoes. They are long and a bit curly so I just sliced width-wise to get a lot of very tiny discs that can be evenly distributed amongst the potatoes. This prep is mostly a chop and drop, so it’s super simple. Next is the dill. Dill has such a unique flavor and for the past 2 days I’ve been trying to come up with the right words to describe it. 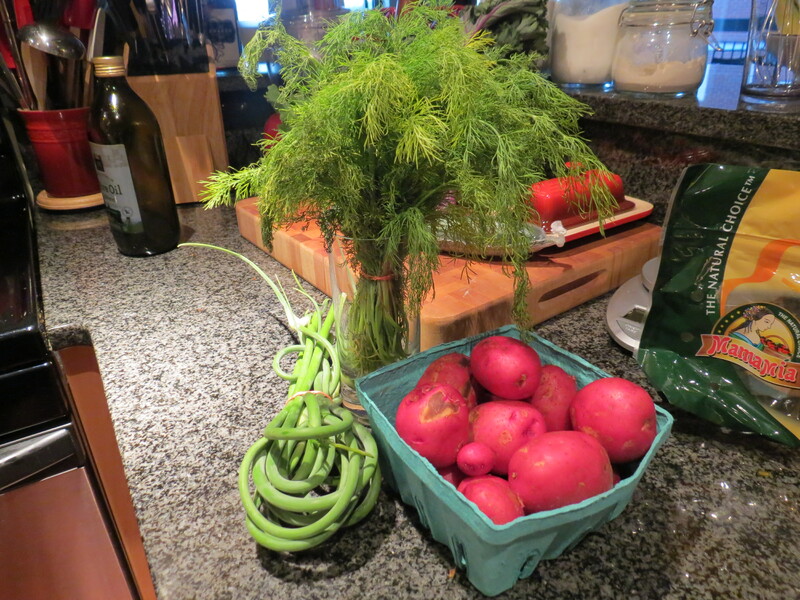 Fresh dill is a bit herbaceous and has almost a parsley taste, but once roasted, it becomes more complex and really elevates the simple potato to the next level, especially when prepared with salt (or in my case, garlic salt) to help pronounce it’s flavor. 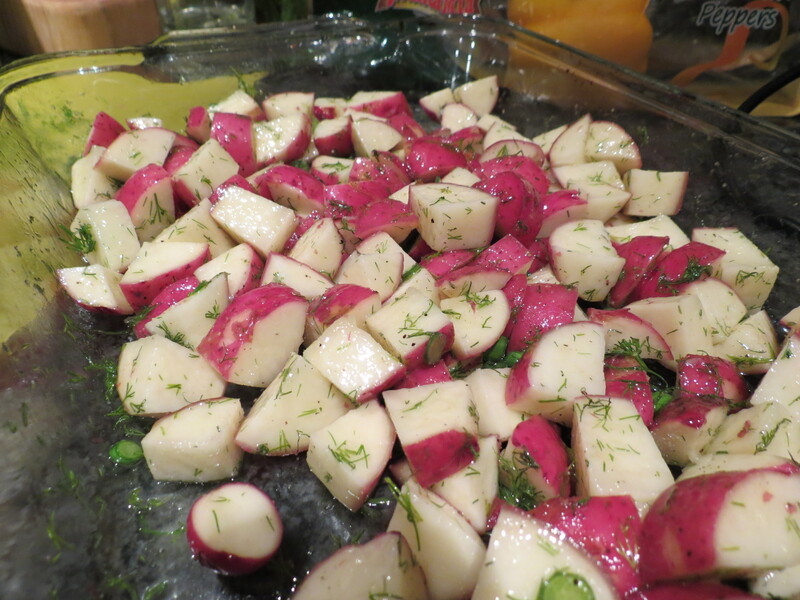 Add chopped dill and garlic salt to roasting pan. 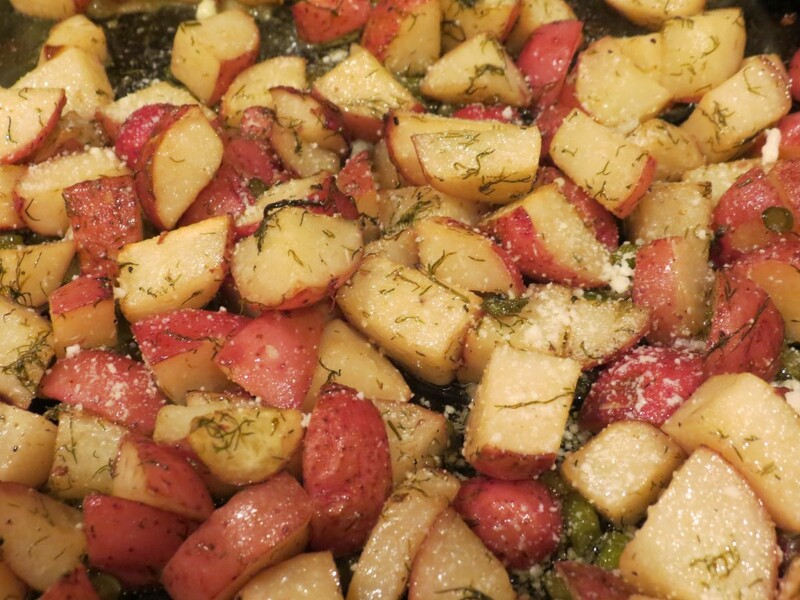 Add olive oil and lemon juice and mix all ingredients until potatoes are evenly coated. Since I didn’t have fresh lemon juice I added a lemon olive oil and artificial lemon juice. If you have a lemon you’d probably want to start with the juice from half a lemon and then save the other half for a quick splash after the potatoes come out of the oven. Roast at 450* for 30 minutes, mixing at least once during cooking time. You’ll know they’re done when they are browned on the edges and easily pierced with a fork. 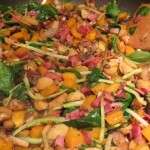 Immediately before serving, sprinkle with Parmesan cheese and lemon juice and give it a quick stir before enjoying. This can easily serve 4 as a side dish or can serve 2 and be used to create a great leftover makeover salad or Spanish omelette the next morning! 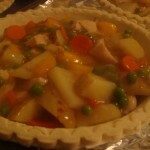 This entry was posted in SideDish by michcorbett. Bookmark the permalink.